One major stressor on the body can be heavy metals. 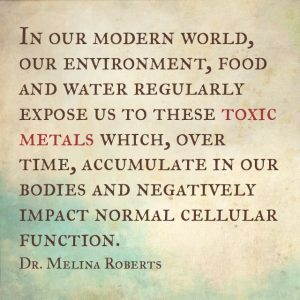 In our modern world, our environment, food, and water regularly expose us to these toxic metals which, over time, accumulate in our bodies and negatively impact normal cellular function. 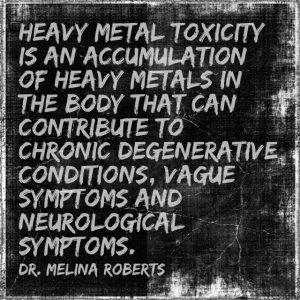 Heavy metal toxicity is an accumulation of heavy metals in the body that can contribute to chronic degenerative conditions, including cardiovascular disease, Alzheimer’s disease, Parkinsonism, dementia, multiple sclerosis and osteoporosis. Heavy metals can also cause vague symptoms such as chronic pain, chronic fatigue, brain fog, depression, headaches, dizziness, and neurological symptoms such as numbness, tingling, burning or paralysis. Many people don’t think of this toxicity, so it often goes undetected or misdiagnosed. 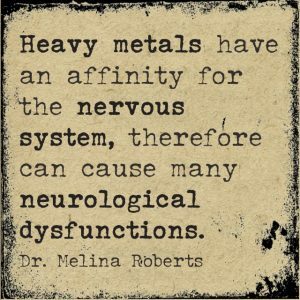 Heavy metals have an affinity for the nervous system, therefore can cause many neurological dysfunctions. 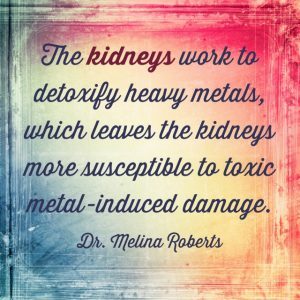 The kidneys work to detoxify heavy metals, which leaves the kidneys more susceptible to toxic metal-induced damage. Heavy metals cause inflammation in the body, which over time damages tissues. Heavy metals cause immune dysfunction which can lead to chronic infections and autoimmune diseases. Heavy metals are hormone disruptors which can contribute to hormonal imbalances, fertility issues and hypothyroidism. Heavy metals can displace essential minerals which can contribute to the development of osteoporosis.